This homemade version of Bisquick will yield about 5 smaller batches of biscuits, pancakes, coffeecakes, cobblers, pizza rolls or cinnamon rolls. There are so many options! Once you have the mix ready, store it in a cool place for a quick dessert or addition to a meal. You can use this mix in recipes calling for Bisquick. The original recipe (even larger) comes from the MCC Plaza Kitchen where my mom used to make biscuits on a regular basis. In a large bowl ( I use the largest Tupperware bowl) mix shortening into dry ingredients, using a pastry cutter. Store in a sealed container, in a cool place for up to 3 months. Does not need refrigeration, but I believe the dough may be easier to work with when mix has been refrigerated. Stir liquids into dry ingredients, using a fork, until all crumbs have been absorbed by the liquid. It may seem dry at first, but keep stirring and it will come together. Remove to floured surface and gently shape to smooth out into a 5x8 inch rectangle, using your hands. Do not over knead as it will make them tough. Better to have them look rustic. Cut into 8 pieces. Bake at 400 F for 12-15 minutes on ungreased baking sheet. Now this is something I've been looking for! Recently, a recipe called for Bisquick and I could not imagine, not having any, how to accomplish it. Pinning stat! Can you forward the recipes for the pizza rolls, and the cinnamon rolls? You can definitely use butter! Store refrigerated, like anonymous said. I use lard instead of shortening. You can make it yourself, altho' it is very time consuming. If you don't want to make your own lard there are several brands you can buy. Make sure you check the ingredients before you buy that brand. Couldn't you add the butter when making the biscuits (with buttermilk)? Then you wouldn't need to refrigerate it, right? yes... you'd just have to figure out the amount (of butter) and it would not make it quite so "quick." The mix can be halved and, if stored in a Ziploc bag, does not take up much room in the fridge. I know this is an old post, but some may be directed here from time to time. I wanted to note that this quick bread is derived from Bannock, made by First Nations people since the time of the fur traders, who brought it from Orkney. First Nations people also call it fry bread, since it is usually made on sticks or pans over an open fire. I think the Orkney variation would have been called Scones. I doubt they had baking soda or powder that far back so it might have been a denser bread. 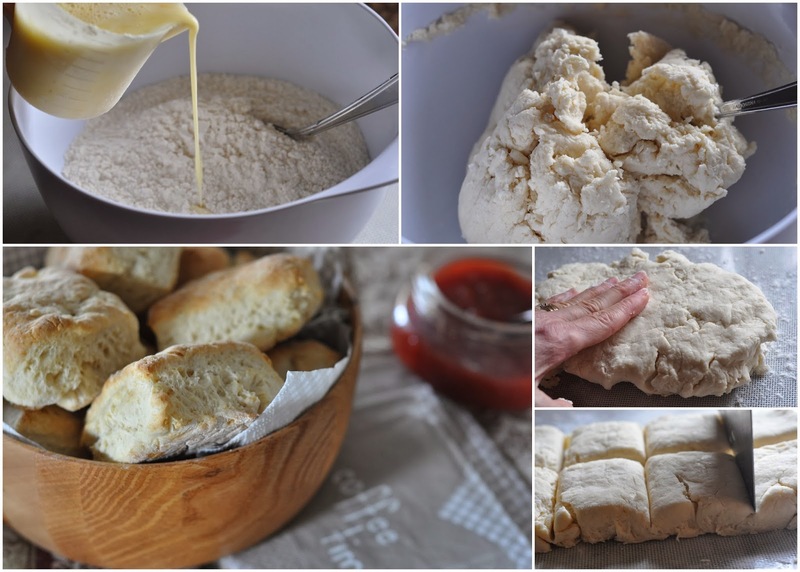 If you want to make a traditional Bannock, use lard, and no sugar, cheese or any other additions, and then use lard to fry the squares, turning over. I just mixed up a batch of this & made biscuits for supper. They're the best biscuits I've ever made! Thanks for sharing this recipe. I would love to also have the recipe for making pizza & cinnamon rolls using this mix. Thank you for your comment! As to the rolls, I would be guessing at the amounts at this time. One day I will measure and be sure before posting. I have a similar recipe for basic quick mix (without the shortening). So, so handy for so many things. I even use it for making some quick dumplings in soups. Your recipe looks really good! Have you tried it using coconut oil? I've heard that coconut oil can be used in baking although I haven't tried it. I have not tried it for biscuits. Probably would work, just may be a different texture. I like this mix because I used spelt flour and that makes it Gluten-free for me! I have given up on round biscuits.....too much "scrap" left over. Cutting them square is the perfect answer and a lot less to deal with. I use my bench scraper to cut and it is handy for counter top cleanup. Thanks for the recipe. I want to make recipe from scratch to avoid any soy or soy by-products for health reason and don't use Biscuick. There 's even soybean oil in shortening so this makes me happy to be able to use this recipe. I wish you could come up with a Panko type crumb recipe mix.